A bodegón in Spain refers to a still-life painting of items one can find in a pantry popularized in the 17th century by Diego Velázquez. 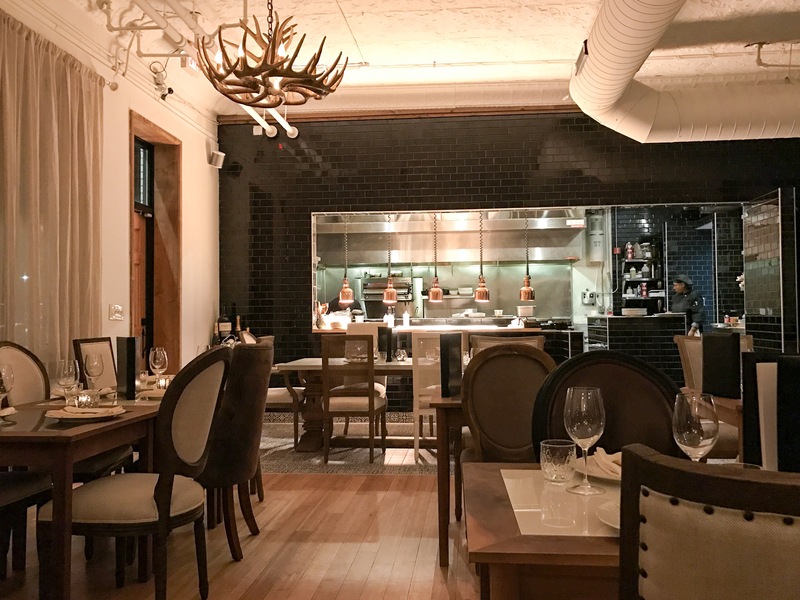 But Bodegón in Milwaukee means a dining experience like none other in the city featuring the rustic cuisine of Spain set in a 108-year old building in Walker’s Point. The white-washed historic building now called Hotel Madrid also features a trendy bar scene, a wine cellar that boasts over 300 wines and two soon-to-be-completed suites for overnight stays. The atmosphere is elegant and romantic, with high ceilings and white walls with gold trimmings. Traditional traje de luces worn by Spanish matadors rest on busts on the walls and rustic chandeliers of antlers hang high above the tables. The owners of Bodegón thought of everything while deciding on the decor, even the small details such as the copper finished silverware and the bohemian glass tumblers for water. Needless to say, it was the perfect date spot with my mom. We both started with the sangria, white and red. The white sangria was light, refreshing and not too sweet with hints of tropical fruits mixed over chardonnay and cava. The base of the red sangria was a Tempranillo, my favorite Spanish wine, and the cocktail had a trace of cinnamon to cut the sweetness. 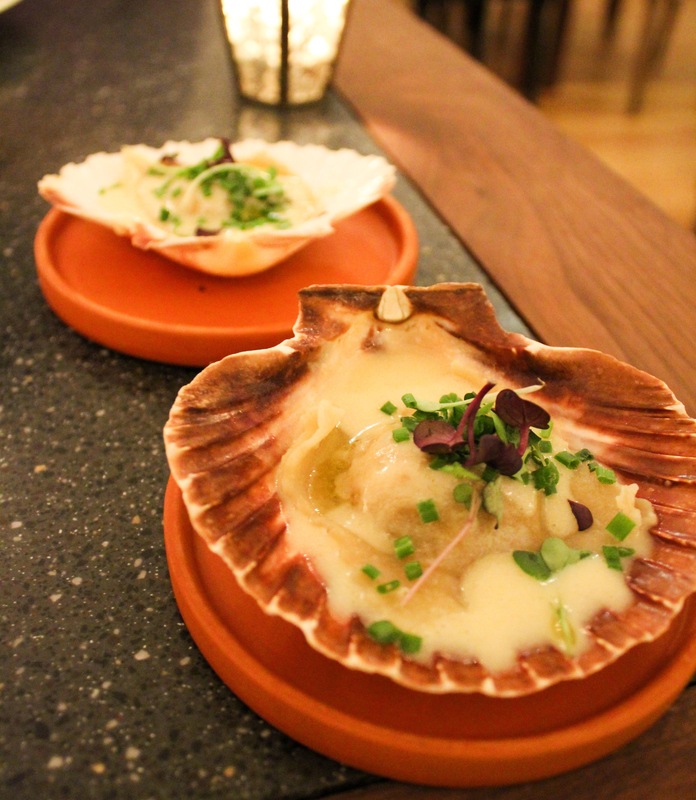 After ordering our beverages, we were promptly brought a sampling of ravioli with a mushroom sauce on a sea shell. For an appetizer, we went all-in with the octopus dish. 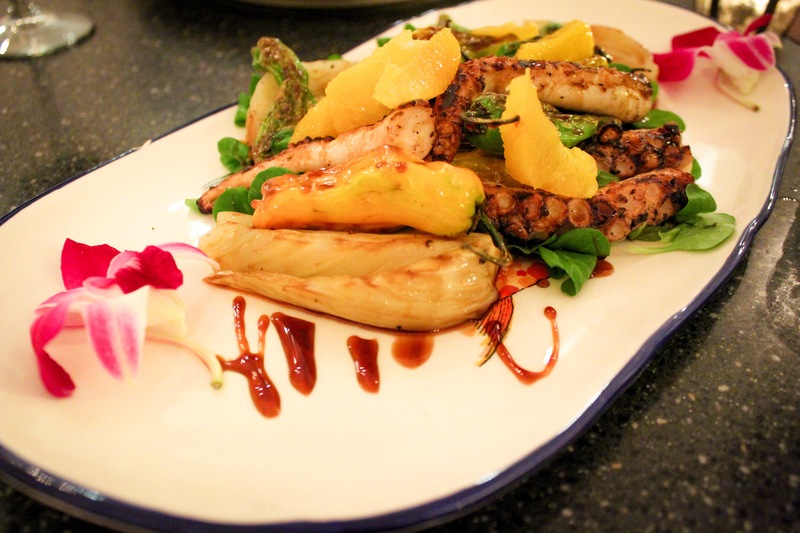 The octopus was grilled and laid atop a bed of mâche with grilled padron peppers and sliced oranges, all coated in a balsamic glaze. The dish was both beautiful and tasty. Since the octopus was a heartier serving, we chose to order one of the shareable sides as a second appetizer. 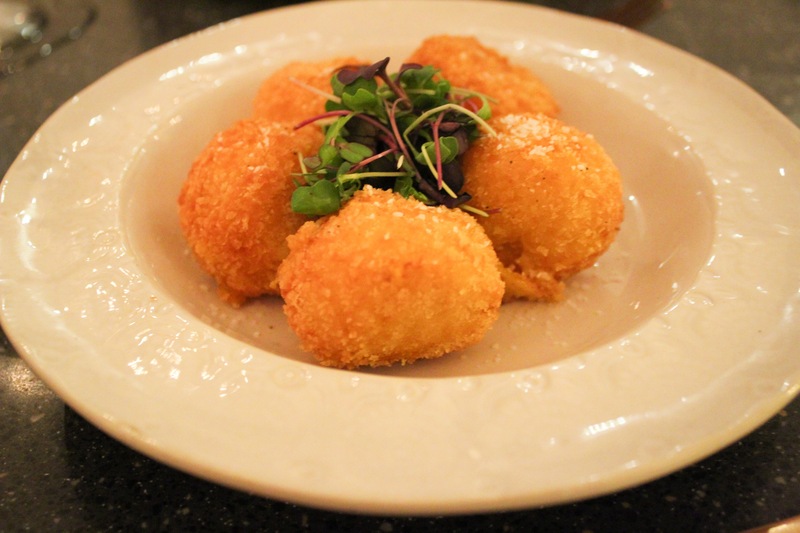 Croquetas are a common dish often found stuffed with a variant of ingredients but most popular are ham and cheese. Bodegón put a sweet spin to the classic tapa but filling the croquetas with whipped sweet potatoes. Typically, mom and I will order one entrée to split but with how good the meal had been thus far we opted for our own dishes. 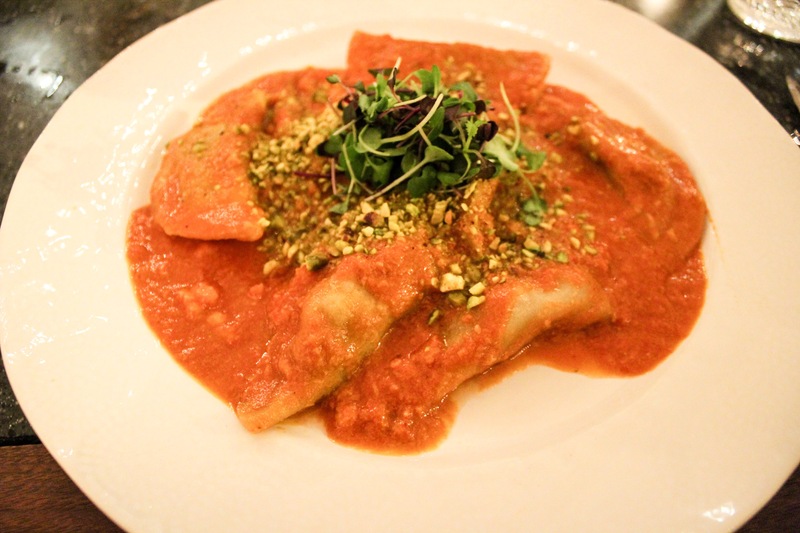 I went for the pasta dish which was a ravioli stuffed with shredded pork cheek smothered in a lobster cream sauce and sprinkled with crushed pistachios. Mom ordered the confit chicken, and in my opinion confit anything is really amazing but Bodegón took the chicken to a whole new level by preparing the confit chicken in duck fat. 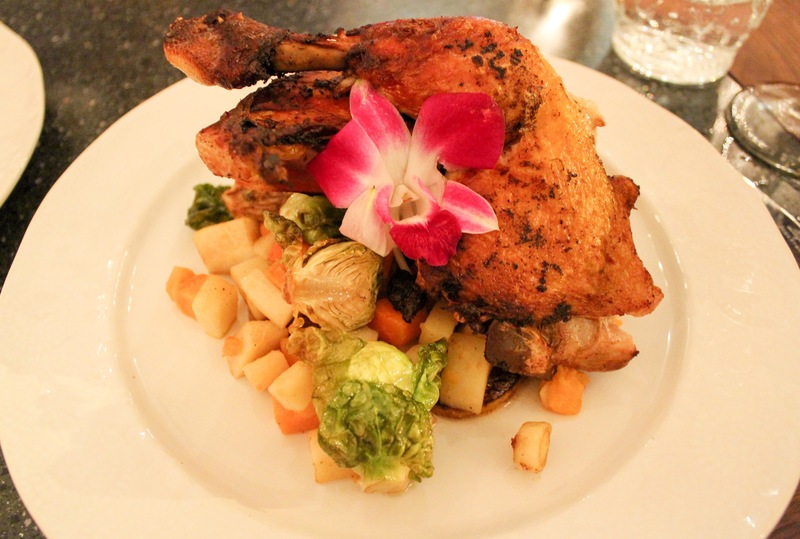 The chicken was over a bed of gnocchi, sweet potato and brussel sprouts with a drizzle of pan jus. It was difficult to not finish both entrées, but we wanted to save room for dessert. For those like us who nearly over-indulged between the appetizers and entrées, Bodegón had the perfect answer to fulfill our sweet tooth cravings: Miguelitos. 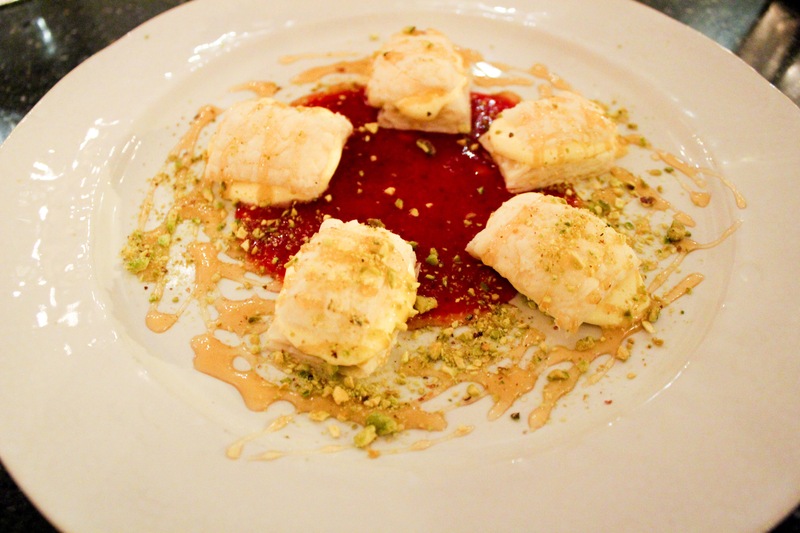 The bite-sized pastries were filled with a layer of saffron cream and drizzled with a tangy cranberry sauce and a mildly sweet orange blossom honey with crumbles of pistachios. Needless to say, we began to lick the plate clean even after our over-indulgence. To complete the experience our check came in a used book. 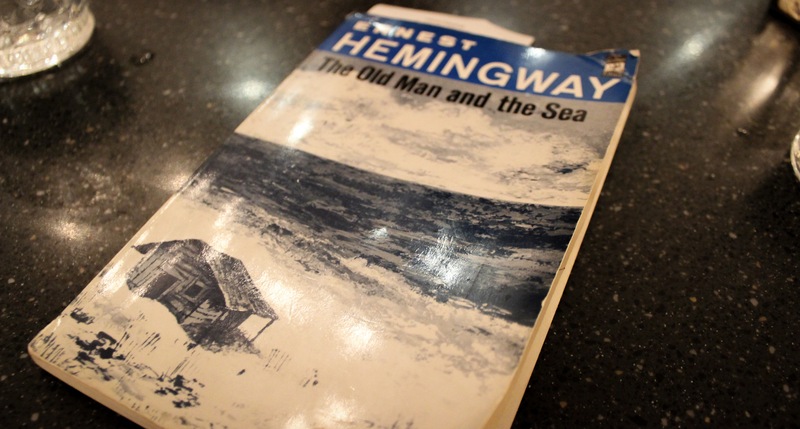 Quite appropriate for the atmosphere, it was Ernest Hemingway’s The Old Man and the Sea. Dining at Bodegón provided a needed escape during the Wisconsin winter (although is was about 70 degrees out that day). 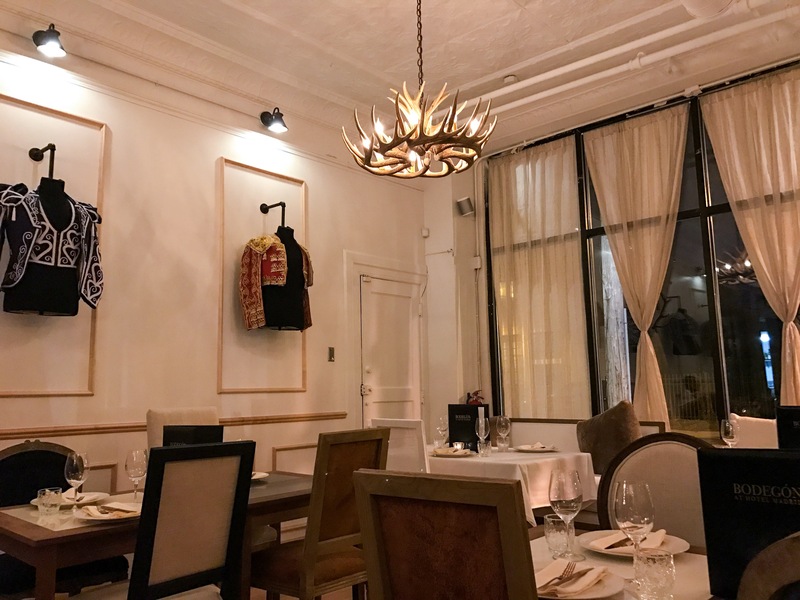 The venue also includes a 80-person patio, and to say I’m anxious for the arrival of summer to wine and dine at Hotel Madrid is an understatement. Salud!